There’s nowhere on Earth quite like Cuba. From the 50s muscle cars to a Cuban cigar, everything about this fiery Latin country screams individuality. And although the Republic of Cuba only returned to cruise itineraries in 2016 – when Carnival Cruise Line’s MV Adonia made its historic trip to Havana – this year Global Ports estimates more than 500,000 cruise passengers will visit the Caribbean’s largest island. Teeming with architectural treasures, stunning museums, great food and friendly people, Cuba and its historic capital Havana are currently on the itineraries of every major cruise line – and since the local tourist infrastructure remains fairly basic – the best way to visit this safe and friendly country south of the Florida Keys is by cruise ship. Passengers sailing into the port of Cuba’s capital city will be treated to panoramic views of the old town and the two 16th and 18th-century forts which guard the harbour entrance. From Sierra Maestra terminal in Habana Vieja, it’s a ten-second walk to the Plaza de San Francisco – one of the city’s four main squares. 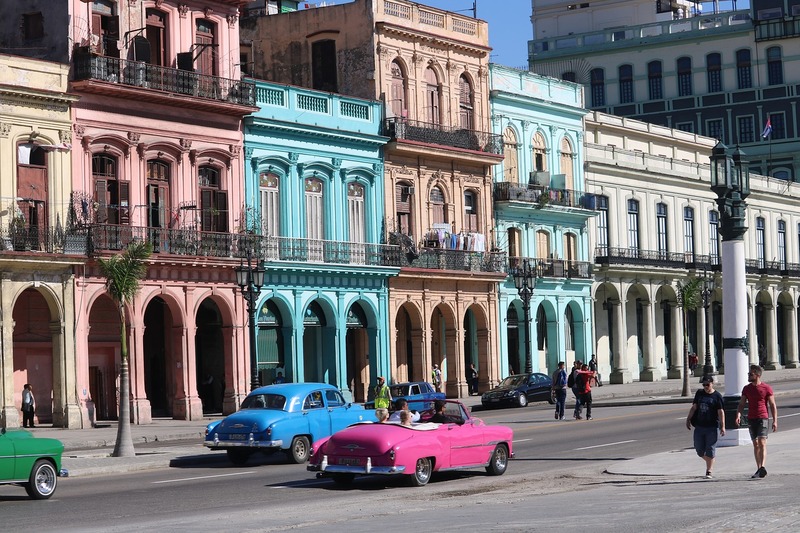 This lively city is also the gateway for a range of shore excursions, including vintage car tours to visit the old streets of Havana, plus trips to see Cuba’s cigar and rum factories. La Habana Vieja: The impressive facades of Havana’s historic old town, La Habana Vieja, are not the only thing to see in this square jam-packed with architectural gems, including the elegant 20th-century mansions in the El Vedado district and the stunningly ornate Gran Teatro, which was opened in 1915, and is now home to the Cuban National Ballet. El Floridita: You know a bar is good if it used to be one of the favoured hangouts of famed writer – and staunch drinker – Ernest Hemmingway. Here, Hemmingway would relax with his wife, Mary, and sip on Floridita’s famous cocktails. Indeed, it is generally accepted that the frozen daiquiri was invented in this bar in 1918, and the establishment is still famous for serving them to this day. Surely worth a tipple? Partagás Factory: You can’t go to Cuba and not return with a box of their world-famous Cuban cigars – even if your lungs would probably rather you didn’t. You can even take a tour of the Partagás Factory – which is relatively close to the port – and see what goes into making Castro’s favourite smoke. Jibaro: Enjoy a taste of Latin America at this snug tapas joint serving Cuban and Mexican classics – with a welcome collection of cocktails. Doña Eutimia: This family-owned creole restaurant has been passing down its recipes for generations and for authentic Cuban cuisine you can’t beat it. La Guarida: Cinephiles will love this exclusive – and expensive ¬– Cuban restaurant which was the setting for Oscar-nominated movie Fresa y Chocolate. Plaza de Armas: The oldest square in Havana is surrounded by stalls and shops selling local wares and souvenirs. La Casa del Habano Quinta: There’s plenty of different places to pick up a box of Cuban cigars in Havana, but few have the pedigree of this popular cigar house. Almacenes de San José: You can’t miss this sprawling market situated right at the port filled with (somewhat tacky) souvenirs and local craft dealers. MasterCard is not accepted in Cuba and Visa cards will not work if they have been issued by a US bank. Passengers should therefore travel with plenty of cash changed into the local peso convertible CUC currency. If you are planning a trip to Central America then you may also be interested in checking out the latest ocean and river cruise news and our most recent Central America cruise features.